For many families, Christmas without television is unthinkable. Watching hours of festive television has become something of a British Christmas tradition. What better way to while away the cold nights than by watching some home improvement programmes? We’ve come up with our 5 favourite specials and shows on offer over the festive period. Heir to Grand Design’s Kevin McCloud, architect George Clarke and his Amazing Spaces series has become a firm favourite with homeowners, thanks to its exploration of unique home improvement projects. 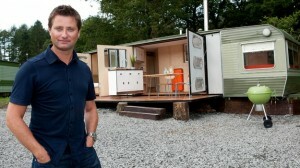 The Christmas special of ‘George Clarke’s Amazing Christmas Spaces’ is sure to get you in the mood for improving your home. In this episode, George visits a man-made stalactite crystal grotto in Surrey, a double-decker bus holiday home in Brighton and a Victorian flat-pack tin chapel in Shropshire that’s been converted to a home. 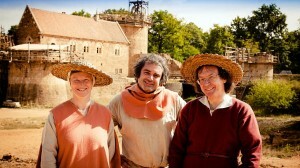 Exploring what life was really like for the inhabitants of a castle in the medieval period, ‘Secrets of the Castle’ uses experimental archaeology to reconstruct the realities of life for a resident of a castle. Fascinating viewing. Fifty eight year old Pauline loves Christmas, so much so that her huge collection of Christmas decorations is starting to make her ceiling collapse and that her house is cluttered she usually can’t invite her family around on Christmas Day. 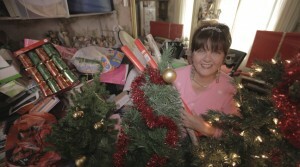 ‘The Hoarder Next Door Christmas Special’ sees Pauline seek help to get rid of her clutter and reclaim her house. Following Sarah Beeny as she tries to save a stately home in East Yorkshire from ruin, Beeny’s Restoration Nightmare explores the sheer amount of work required to renovate an old mansion. The perfect antidote to Downton Abbey, this episode sees Beeny attempt to transform the old gymnasium into a reception room and convince the council that the house is safe. In this heart-warming episode of DIY SOS, Nick Knowles and the team head to Spalding in Lincolnshire to meet Dakota Read and her family. Eight year Dakota was born with quadriplegic cerebral palsy and her home is in major need of being made wheelchair-friendly. With just nine days to complete the task, will Nick and his team be up to it? The windows, doors and conservatories that we offer here in the Inspire range are the perfect way to improvement your home this Christmas and New Year. To find out how we can help you and your property, please get in contact with us on 01977 649 641 or via our website. We love renovating houses and we can also offer advice for any home improvement!